As a holiday pastime, walking Pitlochry uplifts the spirits and energises the soul. Wherever you are, and in whichever direction you turn, there is something beautiful to see. Of course, the walking is just a start. There is no better holiday destination for lovers of the active outdoors. Please read on . . .
Pitlochry and Perthshire, in general, have a growing appeal to tourists in a fast paced world where simple peace and quiet and unspoiled open spaces are acquiring a huge premium. The choice and pace of things to do and see is broad and the problem very often becomes one of decision. For the active there are abundant opportunities to engage in sports from a sedate afternoon on a peaceful lochside spent fishing, a round of golf against a stunning backdrop, a wildlife safari, off-road driving or quad-biking, a spot of hill-walking, a plethora of watersports, such as white water rafting, sailing, jet ski-ing, cycling, mountain biking, hillwalking and hiking. For adrenalin-junkies, we have bungee, micro-lyting or canyoning. Novel opportunities such as the hiring of a Ghillie for a day are becoming very popular. Of more visual interest are the varied offerings for bird and wildlife-watching, a visit to the stunning Highland Wildlife Park – a unique place where you may enjoy viewing truly exotic animals roam in open spaces amidst the stunning scenery of the Cairngorms National Park, or to the Working Sheepdogs display at 4pm each day. 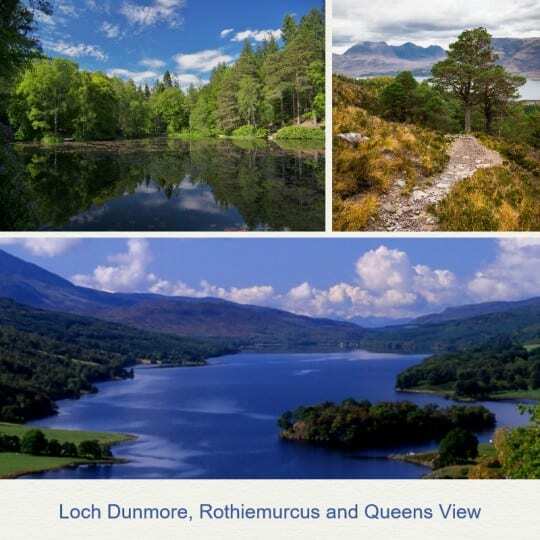 A car tour to take in some gorgeous scenery, visiting places of historic interest, such as Blair Castle, various battlefield exhibition centres, the Crannog Centre and the Highland Folk Museum – a house by house and building by building working example of life in bygone days. Local distilleries, art galleries, craft centres, antiques havens, ornate and spectacular gardens.